Following my review of the RunGap app for exporting your Workout data I was sent a link to a new app called HealthFit which is a less ambitous approach to dealing with the same issue of how to get your Workout data into Strava, Training Peaks, Garmin Connect and more, but still very effective none-the-less. HealthFit is more single focussed on pure export and getting data out for you to put elsewhere through a few simple options. 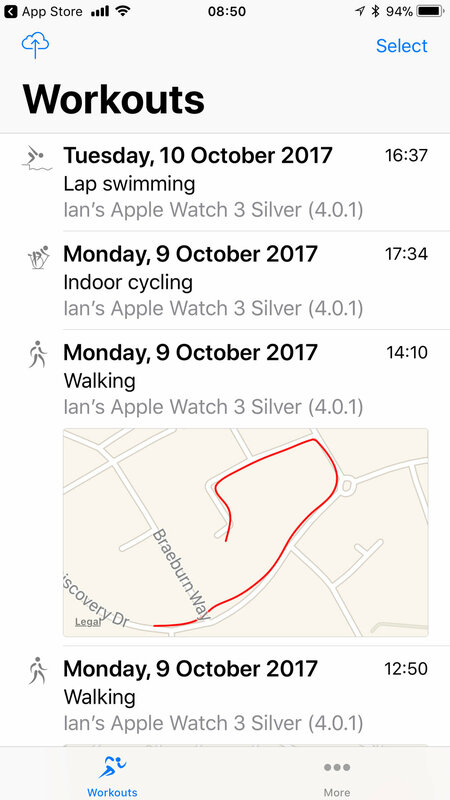 It currently has a single export to Strava (UPDATE: Since version 1.0.9 (8) you can now directly export to TrainingPeaks, and SportTracks), but you can also export FIT files to iCloud or email, which you can then import into other platforms. FIT is a Garmin file format that pretty much every platform I have come across can import. 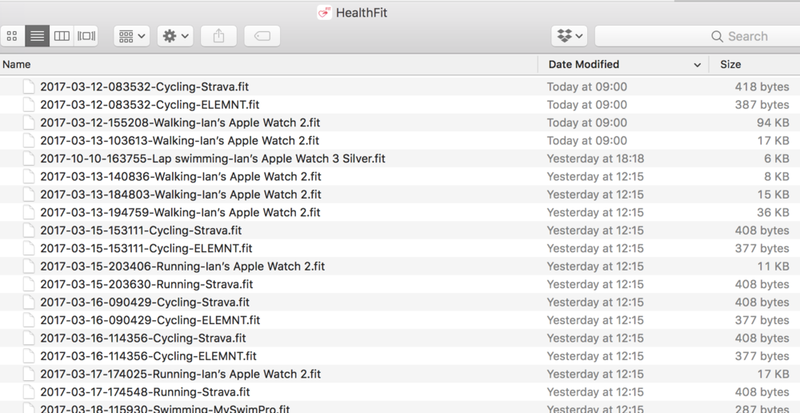 Interestingly I found HealthFit to be more accurate for swimming data exports, which I assume is to do with the construction of the FIT files and how other platforms read them, but RunGap is more comprehensive and quicker if you want to export to Strava, TP, GC, dropbox with one tap and works great for everything else. I expect other apps to start offering the functionality that both these have, probably built directly into their logging capabilities which will mean we can have our workouts logged to Strava as soon as they are complete, much like you can with a Garmin watch and Garmin Connect now. Once these apps start appearing I will be reviewing them on this blog. 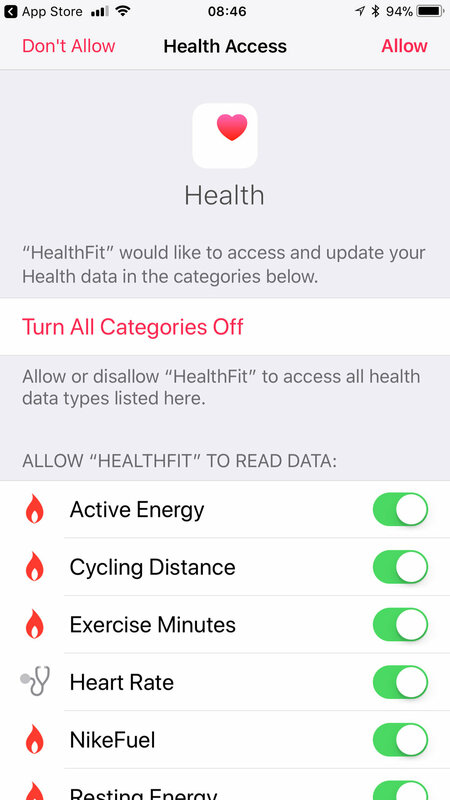 Anyway, you'll need to turn all categories on for HealthFit to be able to read your workout data and will then be shown the main (and really only) HealthFit screen. UPDATE: Originally HealthFit only supported Strava export but with the latest update to HealthFit, v1.0.9 (8) it now has options to export to TrainingPeaks and SportTracks as well - they work in the same way as the Strava export. This means it is super easy to send multiple workouts to all three of these services now. Personally I like to have the option on in Strava to make all new uploads private by default, that way you can add images, change the title or description (to include a reason why your pace was a bit off today for example), then unleash it in to the world and let the Kudos come flooding in. You do that in Strava > Settings > Privacy and turn on Private by Default. This will generate an email with the FIT files attached which you can then send to someone (or yourself if you don't use iCloud Drive for example). UPDATE: Initially this method had some issues with build 1.0.5 (8), however the developer has updated it in 1.0.6(9) to correct those and it's now working well, so I have updated the text and the image here. This is a simple as selecting the upload option in the platform (for example Garmin Connect), and then browsing to the FIT file in your iCloud Drive (or where ever you saved it from an email) to upload. A nice feature of IOS11 means that you can now do this just as easily on the iPhone as you can on the web. HealthFit is a great alternative to RunGap, much cheaper in the long run, and supports easy exports to three of the main platforms in Strava, TrainingPeaks and SportTracks, though requires a bit more effort on your part to get your workout into anything else (such as Garmin Connect) - though not much. I find I am using HealthFit pretty much daily now a days.